View More In Magnetic Therapy. 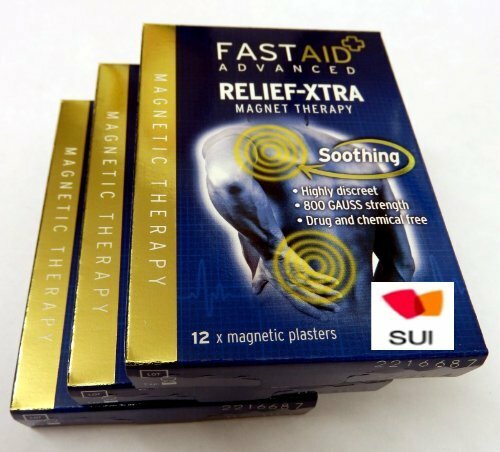 Fast Aid Advanced Relief-Xtra is a small easy to apply ceramic magnet that cab provide soothing without drugs or chemicals. It is completley natural, magnetic therapy has been used for thousands of years and the benefits are usually noticeable within 24 hours. Relief-Xtra magnets are mounted on circular plasters for ease of application and create a magnetic force strength to soother the affected areas. Natural soothing without drugs and chemicals. Discreet and easy to apply to affected area. Safe to use even when wet (do not use with a pacemaker). Soft fabric plaster with hypoallergenic adhesive. Tamper evident packaging. If you have any questions about this product by Robinson, contact us by completing and submitting the form below. If you are looking for a specif part number, please include it with your message.